For most car owners buying tires in Dallas is a big deal, so consult with your cheerful Compton Automotive tire professional about proper size, type and grade for your driving needs. He can help you balance load requirements, fuel efficiency, performance, durability and cost. When buying new tires in Dallas, it’s best to replace both tires on the same axle in order to keep the rolling diameter as close as possible. 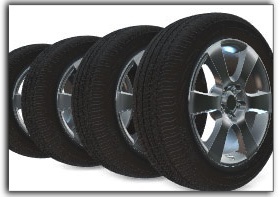 Dallas car owners with four-wheel-drive vehicles should replace all four tires at the same time because you can run into problems if the tires have different rolling diameters due to wear or different type of tire. Four wheel drive vehicles should have all tires very close to the same rolling diameter to avoid binding and wheel hop between the front and rear axles. Also, TX tire manufacturers recommend that if you are buying just two new tires that they be installed on the rear for safer slippery road traction – regardless of which wheels drive the vehicle. Compton Automotive in Dallas has you covered for all of your tire needs including tire repair, tire mounting, wheel balancing, and wheel alignment. We also provide cooling system service, brake service, power steering service, and transfer case service. Need New Tires In Dallas? Buying tires in Dallas is a big deal so, consult with a tire professional at Compton Automotive about proper size, type and grade for your local Dallas TX driving needs. We can help you balance load requirements, fuel economy, performance, durability and cost. When buying new tires, it's best to replace both tires on the same axle in order to keep the rolling diameter as close as possible. If you have a four-wheel-drive vehicle, you should replace all four tires at the same time because you can run into problems if the tires have different rolling diameters due to wear or different type of tire. Four wheel drive vehicles should have all tires very close to the same rolling diameter to avoid binding and wheel hop between the front and rear axles. Also, tire manufacturers recommend that if you are buying just two new tires that they be installed on the rear for safer slippery road traction - regardless of which wheels drive the vehicle. At Compton Automotive, we also offer transfer case service. When talking about stopping power, we tend to focus on our brakes. But our tires are where the rubber meets the road. So having good brakes isn't enough: we have to have tires with enough traction to translate braking power into stopping power. Let's focus on stopping in wet conditions. In order for a tire to have good contact with the road, it has to move the water out of the way. If it can't move the water, the tire will actually ride on top of a thin film of water. To move water out of the way so the tire has channels for water to flow through. Look at a tire and you'll see channels that run around and across the tire. They're designed to direct water away from the tire so it can contact the road better. The deeper the channel, the more water it can move. A brand new tire has very deep channels and can easily move a lot of water. As the tire wears down, the channels become shallower and can move less water. When it wears down enough, it can seriously affect your ability to stop on wet roads. Consumer Reports and other advocate groups think that a good standard of replacing tires when the tread is worn down to four-thirty-seconds of an inch. That's 3.2 millimeters. 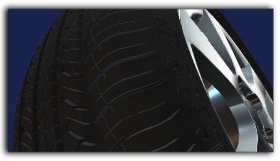 When tires are worn to two-thirty-seconds of an inch, the tread wear bar is visible. So the recommended standard has twice the tread depth as a completely worn out tire - and that little bit of additional tread makes a big difference. Stopping distances are cut dramatically on wet roads. A safe stop from freeway speeds with four-thirty-seconds of an inch of tread could result in a crash with worn out tires. There's an easy way to tell when a tire's worn to four-thirty-seconds of an inch. Just insert a quarter into the tread. Put it in upside down. If the tread doesn't cover George Washington's hairline; it's time to replace your tires. With a Canadian quarter, the tread should cover the numbers in the year stamp. At Compton Automotive we install quality NAPA replacement parts. To learn more about NAPA AutoCare, visit www.NAPAAutoCare.com.